Can e Cigs (eCigarettes) Cause Cancer? e-cigarettes and vaping have risen to popularity in recent years because many people thought they were safer than smoking traditional cigarettes. It turns out they are not. In 2016, the Food and Drug Administration (FDA) extended the Family Smoking Prevention and Tobacco Control Act to cover e-cigarettes in order to control the sales and marketing of them. The American Lung Association1 has been sounding the alarm on e-cigarettes for some time now and reported a 900 percent increase in teenager’s use of e-cigarettes between 2011 and 2015. They are far from alone. There are numerous studies showing the high risks of e-cigarettes and vaping. The health dangers of e-cigarettes are posed by the manner in which they work. They are battery operated and when activated, the battery heats up the nicotine and vaporizes the chemicals inside, creating an aerosol. The aerosol contains extremely fine particles of the chemicals and metals which are then inhaled into the lungs, creating a health hazard. Many studies have documented these risks. 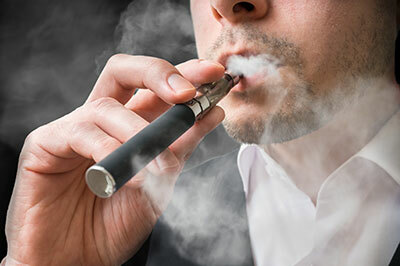 A study published in the New England Journal of Medicine4 (NEJM) reported that e-cigarettes contain chemicals including propylene glycol, glycerol, or both, plus nicotine and flavorant chemicals. The study reported that in many samples of vaped e-cigarettes “more than 2% of the total solvent molecules have converted to formaldehyde-releasing agents, reaching concentrations higher than concentrations of nicotine.” The EPA has classified formaldehyde as a probable carcinogen linked to leukemia. In addition, vaping converts some of the chemicals into the same agents that are used as industrial biocides. The health risks of inhaling the toxins and chemicals contained in e-cigarettes especially in young people: the rate of e-cigarette use among middle school and high school students tripled between 2013 and 2014. The dangers posed by liquid nicotine (refills for e-cigarettes) to children: liquid nicotine is not packaged in child proof or tamper proof containers. One teaspoon of liquid nicotine is a lethal dose for a child. Inhaling toxins and chemicals of any type poses numerous health risks, especially when they are fine particulates in aerosol form created by e-cigarettes. They can cause oral diseases7, inflammation, and DNA damage. They can cause damage to periodontal ligaments in the oral cavity which support the teeth, and cause bone loss and tooth loss. The U.S. Surgeon General8 reports that the nicotine contained in e-cigarettes can cause “nicotine addiction, mood disorders, and permanent lowering of impulse control”. There is also some evidence9 that e-cigarettes may increase heart rates and blood pressure. In short, e-cigarettes and vaping are no healthier than traditional cigarettes. In fact, they may carry their own special risks. Not only do e-smokers and vapers risk permanent damage to their lungs, they may also worsen chronic diseases like asthma. Avoiding e-cigarettes, along with all other types of nicotine, is the best option for maintaining your health, your children’s health, and the air that we all have to breathe.